Adapted from Mark Kurlansky's adult work Birdseye: The Adventures of a Curious Man, this work of nonfiction is for kids interested in science, biography, and early entrepreneurs. 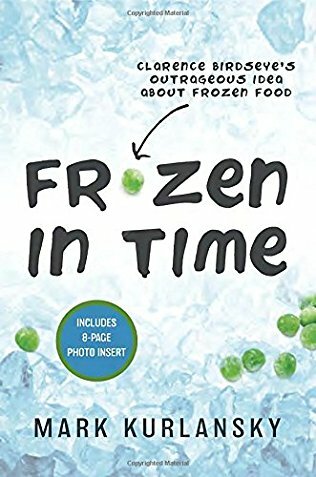 Frozen in Time explores the life story of Clarence Birdseye, the man who revolutionized the frozen food industry and changed the way people eat all over the world. Adventurer and inventor Clarence Birdseye had a fascination with food preservation that led him to develop and patent the Birdseye freezing process and start the company that still bears his name today. His limitless curiosity spurred his other inventions, including the electric sunlamp, an improved incandescent lightbulb, and a harpoon gun to tag finback whales. This true story of an early inventor/entrepreneur is not only thrilling but explains the science and early technology behind food preservation. Available in hardcover and paperback, each edition includes an 8-page black-and-white photo insert.